What Will I Learn in an Online Bachelor's in Public Health? If you are interested in improving the health of individuals or communities, a public health bachelor's degree can lead to a job in a growing field that also has a positive impact on society. Careers in healthcare -- such as health educators, dieticians, medical and health services manager, and social and community service managers -- are increasing at faster than average rates. According to the Bureau of Labor Statistics (BLS), positions in the field are projected to grow 10-17% over the next decade. Below, we've covered how to get started in an exciting and rewarding profession that has a positive impact on the health and wellbeing of people. The public health bachelor's degree at Allen College prepares students for leadership positions in the field. Program participants build a foundation in patient care, epidemiology, healthcare policy, delivery methods, and population patterns. Students also develop the critical thinking, decision making, and communications skills necessary for administrative roles. A subsidiary of the UnityPoint Health System, this Waterloo, IA, institution has offered healthcare education for almost a century. Today, the bachelor of health sciences with a major in public health can be completed fully online. Allen’s 124-credit curriculum takes a holistic approach to healthcare education. Students complete 88 credits of general coursework, and 36 credits in public health. Many classes begin in the fall but program participants may also matriculate in the spring. One summer session is required, which is usually reserved for capstone projects or nursing classes. Most students take classes part time. Applicants must have a minimum of 25 hours of college credit and a 2.7 GPA to gain admission. With the increasing need for public health experts, UNC Greensboro offers an online public health bachelor’s degree. The program emphasizes disparities in the U.S. medical system, and explores ethnicity, gender, and socio-economic status. Graduates are prepared to step into entry-level positions upon graduation or to continue on to master’s-level work. Coursework takes participants through all aspects of public health, including advocacy, research, prevention, and the promotion of healthy behaviors. The bachelor of science in public health program is cohort based, and conducted entirely online. Classes are scheduled sequentially and are either asynchronous or held in real-time sessions, and students devote about eight hours a week per course. Applicants must have an associate degree, a minimum GPA of 2.5, and should have completed requisites with a C or better. Online learners pay a substantially reduced rate for tuition compared to students on campus in Greensboro, NC. Offered through UA Online, the Zuckerman College of Public Health’s online public health bachelor’s degree blends healthcare theory with hands-on practice. Though the 120-credit curriculum can be completed entirely online, students are required to perform a field practicum, gaining valuable on-the-job experience. The program is career-oriented, and promotes an understanding of health and disease through modern public health principles. A practical application track is also available to qualified students. Admission to the program requires a GPA greater than 2.5 and the completion of all pre-health prerequisite programs. No visits to Tucson are necessary. Delivery methods for online coursework vary at UA. Some classes in the bachelor of science in public health program are asynchronous, while others meet at specific times. A minimum of 30 credits must be earned through UA. Tuition rates are competitive, and online learners pay less than what Arizona residents pay for their on-campus classes. Excelsior College has been a national leader in healthcare education for decades, and it offers an innovative online public health bachelor’s degree. Designed for working adults, the program offers academic credit for medical licenses and professional certification. Students already working in the field can finish their degree faster than elsewhere, and at a lower cost. The 120-credit curriculum received input from public health experts, and graduates leave with leadership and decision-making skills, effective communication techniques, and a solid foundation in the legal, ethical, and policy issues facing public health in the modern world. Coursework in the bachelor of science in health sciences – public health emphasis program is asynchronous and scheduled in accelerated, eight-week sessions. The curriculum is divided between classes in the arts and sciences (60 credits) and health sciences (60 credits, including nine in the public health emphasis). Students are also required to complete a health sciences capstone project. Excelsior allows transfer of up to 117 undergraduate credits. The online public health bachelor’s degree at University of West Florida builds a foundation for careers in healthcare and for further graduate study. With an emphasis on the philosophy, history, legal aspects, and recent trends in public health, students receive a well-rounded base to take their next step in this exciting and growing field. Students apply for admission to the health sciences department, and they can only do so as sophomores. Applicants must have at least a 2.5 GPA on all previous college work, and must have completed prerequisites in biology, statistics, algebra, and psychology with a C or better. The 120-credit bachelor of science in health sciences in public health includes 60 credits earned in the major, and 18 credits of electives selected with the help of an advisor. Students also take the health sciences research seminar, which is typically completed near the end of their studies. The entire curriculum can be completed online, with no visits to UWF’s Pensacola campus necessary. Online students are often eligible for an out-of-state tuition waiver. Founded in 1899, Northern Arizona University has grown into a leader in web-based education. Among more than 100 degrees offered entirely online is the public health bachelor's degree. The program explores public health administration through social and behavioral patterns, the environment, disease, and how modern medicine adapts to them. The entire 120 credit curriculum can be completed online, but there is a fieldwork requirement. NAU was one of the first universities to offer web-based learning, and now a third of its students study in virtual classrooms. Most digital courses are run asynchronously, though a few may have real-time requirements. 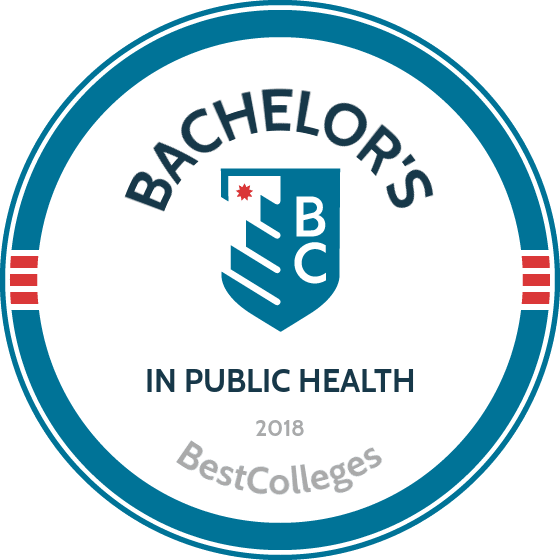 In addition to the general education curriculum, students in the bachelor of health sciences: public health program complete at least 68 credits in their major and maintain a 2.5 GPA. Students can pursue their degrees on a full- or part-time basis. Online learners pay slightly less than those enrolled on campus. One of the country’s largest non-profit institutions of higher education, National University is also among the largest providers of online education with almost 100 degrees offered online. The La Jolla, CA-based university offers a bachelor’s in public health that establishes a broad base in the liberal arts and sciences. The program views community health from an ecological perspective, and focuses on the role health professionals play in preventing disease and improving the public’s quality of life. Like all programs at National, the degree is career-oriented, readying graduates for entry-level positions in the field. Additionally, graduates may be ready to sit for the Certified Health Education Specialist exam. The curriculum of the bachelor of science in public health requires 180 quarter units to complete, almost a third of which are prerequisites in biology, psychology, sociology, and physiology. The major itself is 15 courses, including a field practicum, which is an eight-week, 120-hour immersion in the professional world. Students create an electronic portfolio and complete a capstone presentation of their experience. Most of National’s classes are asynchronous. Admission is based on academic records, test scores, professional experience, and an interview. California Baptist University (CBU) brings a Biblical perspective to the field of public health. Students in this Los Angeles institution’s online public health bachelor’s program are required to complete six units of Christian studies in the major, and at least six more in a general education core. The bachelor of science in public health program develops career-ready professionals with the expertise to begin master’s-level work. The 124-credit curriculum takes students through the core disciplines in public health – behavioral science, wellness, epidemiology, biostatistics, and environmental and occupational health. Coursework at CBU is scheduled asynchronously in accelerated eight-week sessions and is available year-round, allowing students to earn their degrees more quickly. The major requires 48 credits, and most program participants take 16 months to finish. A maximum of 100 credits can be transferred in, but only 30 credits may be upper level. Admission requires a high school diploma or equivalent, but at least 24 college credits is preferred. A minimum GPA of 2.0 is required. Online learners also enjoy dramatic tuition savings compared to their on-campus counterparts. SNHU’s online undergraduate degree in public health incorporates a variety of disciplines into its 120-credit curriculum. Students engage subjects like epidemiology, biology, and healthcare policy, but they also delve into ethics, law, research, sociology, education, and communication. This broad base prepares students for the workforce or graduate programs. The program also focuses on the best methods of protecting the health of populations and improving quality of life. Every credit required can be completed entirely online. Courses in the bachelor of science in public health program are asynchronous and scheduled in intensive, eight-week sessions, six times per year. The degree is split among 45 general education credits, 48 major specific credits, and 27 electives. Online students have access to a full slate of support programs, from advising and tutoring to career guidance and technical help. SNHU also has a liberal transfer policy; as many as 90 credits may be transferred. The university boasts some of the lowest tuition costs in the nation. Kent State has one of the most comprehensive online bachelor’s in public health programs available. The 120 credit program’s four concentration options allow students to tailor their education to their specific interests. Five other concentrations are available on campus, and students can further narrow their education by taking coursework from those areas. The university’s bachelor of science in public health program offers a broad scope for students to excel in their specialty. All coursework can be completed online, with no visits to Kent, OH required. Coursework is mostly asynchronous, and students select from concentrations in allied health, community-based health, health promotion and education, and health services administration. Some concentrations grant as many as 12 credits for previous work experience or licensure. Students must accrue 21 credits in general education, 42 in the major itself, and 56-61 credits in their areas of concentration. Online students who live outside Ohio pay reduced tuition compared to their on-campus counterparts. Technical support, career counseling, and library help are all available to web-based learners. While all online public health degree bachelor's programs differ, most require students to complete a minimum of 120 credits, and blend general education courses, electives, and major courses. Some programs also offer specialized concentrations in areas such as healthcare management, health promotion and wellness, and global health. While curricula will vary, many programs require some of these courses. Issues in Public Health: This course introduces the history, theories, and core values of public health to online public health degree bachelor's students. Students learn the structure of the public health system and the main knowledge areas of the field. Courses cover key concepts, such as mortality, disease, and disparity within populations. This course is often a prerequisite for many other courses and is essential for anyone working in public health. Epidemiology and Disease Control: Disease control is a main concern among public health practitioners, and this course introduces students to the principles of epidemiology, along with specific tools used for monitoring and evaluating public health. Social and behavioral factors that affect human disease may also be included. These themes are particularly relevant to health care administrators, social and community service managers, and public health educators. Research and Assessment: Many public health workers are responsible for researching and developing new programs, while also assessing current offerings. Bachelor's degree in public health students learn basic components of research methods related to public health, as well as the application of assessment instruments and statistical analysis to current health programs. Public Health Education and Communication: One of the main roles of public health workers is to educate the public. Students in this course develop the necessary communication skills to perform this duty. The class also examines the impact the media and internet have on health issues. Students learn the ways in which public health education can improve individual and community health. Regional and national accreditation are the two primary types of institutional accreditation. Regional accreditation is considered the most prestigious form of accreditation, as the Department of Education (ED) approves only seven accrediting agencies in the country. National accreditation usually applies to career and trade-related institutions; because of the diversity among these colleges, accreditation requirements are not as standardized. Many graduate programs look for students to have a degree from a regionally-accredited institution, and courses from regionally-accredited colleges are usually easier to transfer to another school. Additionally, individual programs within schools may be accredited by expert organizations in the field. Accrediting agencies, both regional and national, are recognized by the ED or the Council for Higher Education Accreditation (CHEA). If a college is not accredited by a ED-approved agency, they are unable to offer federal financial aid to students, and often credits will not transfer. The ED and CHEA provide necessary oversight to ensure accrediting agencies are meeting basic standards. Prospective students should always check to see if an institution is accredited on the ED's website. Program-specific accreditation of public health bachelor's degrees may be granted by the Council on Education for Public Health (CEPH). This ensures that a degree meets certain standards that CEPH deems essential in public health programs. Students can look for accredited programs and schools on CEPH's website. According to the Bureau of Labor Statistics, careers in public health are experiencing faster than average growth, and almost all of these positions require candidates to have a bachelor's degree. Public health graduates develop their communication, health, managerial, and evaluation skills, leading to a number of different professions. Many of these public health professionals are employed by the government, individual and family services, and hospitals. Health educators promote wellness within communities by changing behaviors, collecting data, and working on specific health concerns within communities. Salaries within these professions vary, but the median annual salary for health educators is $53,070 and the median annual salary for community health workers is $37,330. These professionals use their knowledge of diet and nutrition to promote health and manage disease. They assess health needs, counsel patients on nutrition issues, and develop and evaluate meal and nutrition plans. Employment is expected to grow 14% -- faster than average -- as people are increasingly aware of a diet's role in preventing and treating diseases. Also called healthcare administrators or executives, these professionals plan and direct health services. They may oversee a facility, department, or clinical area. With a faster-than-average rate of growth at 17%, these managers have a median annual wage of $96,540. Managers must have at least a bachelor's degree, and master's degrees are often required. These managers coordinate social service programs and community organizations. They focus on a specific populations, such as children or the elderly, and some work with organizations focused on unemployment or mental health. Social and community service managers work in shelters, offices, clinics, and hospitals. By evaluating work environments, occupational health and safety specialists inspect workplaces to see if they are adhering to safety, health, and environmental regulations. This job often requires fieldwork and travel to worksites such as factories and mines. One of the main factors in the salaries of health educators their place of employment. According to the Bureau of Labor Statistics, the median annual salary for health educators in hospitals is over $23,000 more per year than health educators working in social assistance. The range of health educator salaries can also vary greatly beyond the median annual wage. According to the BLS, in May 2016 the bottom 10 percent of health educators earned below $30,400, and the highest 10 percent earned above $95,730. There are many sources for funding a public health bachelor's degree education, including federal financial aid, scholarships, grants, and loans. To determine your eligibility for federal financial aid or other assistance, students should first complete the Free Application for Federal Student Aid (FAFSA). Additionally, institutions award scholarships and grants at the time of admission according to need or merit. Scholarships may also be awarded by a college's school of public health, and students should always search for outside scholarships related to the profession, such as those listed on publichealthonline.org.